When incurring in a product marked with the coloured bar “Phased-out product”, it means that all the articles belonging to that product family have started to be gradually withdrawn with effect from the date indicated in the coloured bar (typically October or April). The product supply will be definitively discontinued within 24 months since the above date. 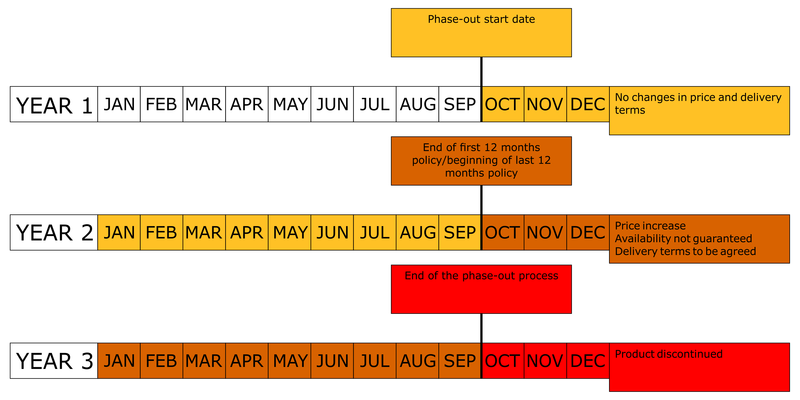 The first 12 months of the phase-out process are marked with a yellow bar. During this period, the ordinary supply conditions will be applied to the product (no changes in price and delivery terms). The last 12 months of the phase-out process are marked with an orange bar. During this period, the price shall rise, the availability is no longer guaranteed and the delivery terms shall be agreed on each time.